As a lifelong aviation enthusiast and past president of an Experimental Aircraft Association (EAA) regional chapter, Turbine Technologies Director of Sales and Marketing, Perry Kuznar, sought to combine his high-flying interests with a demonstrated educational need. "So many topics are required in today's engineering curricula, that it is difficult to get experience with problems that have direct application to industry. Lab classes are meant to stimulate thinking from a practical perspective, but so often the lab sessions are just contrived extensions of the lecture problems. Students should get extra credit for imagining that a Tinker-Toy collection of aluminum tubing and connector blocks are a 'bridge' for this lab and a 'high-tension tower' for the next." "As a member of the EAA and an active participant in several aircraft building projects, I saw how my fellow aviation enthusiasts were getting an exceptional education in the practical aspects of aircraft design, construction and testing by building their own airplanes. It occurred to me that this type of activity would have a natural application to engineering education. A lab or analytical study of a complete airplane project would be impractical, but focusing on a smaller portion would be possible. By selecting the right component to study, the opportunity would exist to study a broad array of typical engineering problems." Perry searched the aerospace industry exhaustively to find the right item for this lab. The goal was to find a structure that was easily dissected into its fundamental components for ease of analysis, yet obvious as to how the individual pieces worked as a structural whole. Additionally, the structure had to be designed and constructed according to accepted industry standards to convey real-world applicability. The ideal candidate was found in a popular sport aircraft tail surface. "An airplane wing contains essentially every type of structural member an engineer is likely to encounter in their career no matter what actual field of engineering they pursue: beams, webs, shear structures, fittings, fasteners - all resisting bending, torsional and shear loads, with indeterminate issues and difficulties such as access holes and so on. A wing could very well be a machine structure to a mechanical engineer, or say a bridge to a civil engineer. A complete wing though, while a perfect subject, would be just too big to get into a classroom. A tail surface, however, is nothing but a smaller wing - yet a very real subject, not a scaled model or imagined problem. My idea was to utilize the horizontal tail surface from an experimental airplane. Once instrumented, supported and given a way to apply a load, we had the True Structures Lab." The complete wing surface is equipped with 12 foil type strain gages in both linear and rosette configurations applied throughout the structure. A custom designed and exceptionally easy to use strain bridge controller assists in the data measurement process. Web based software simplifies the process of converting strain gage voltages to actual strain values. 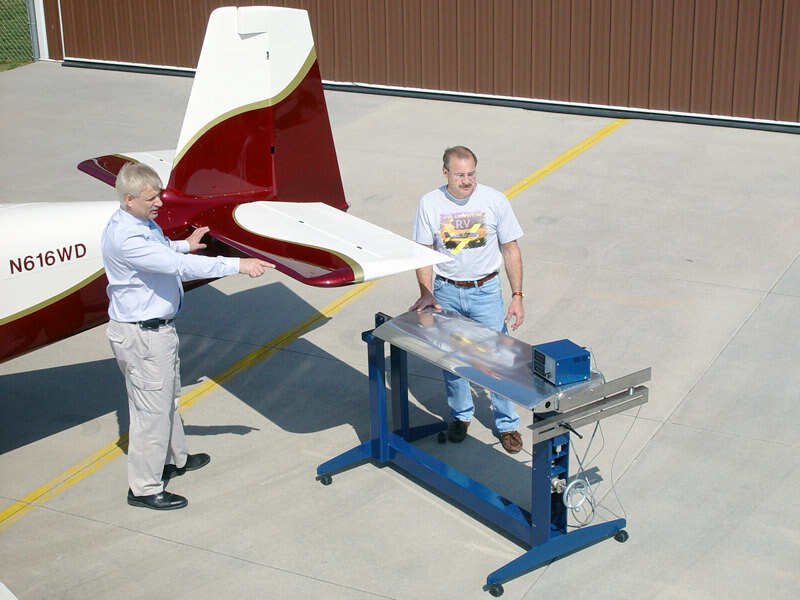 A manually controllable loading device imparts a force to the wing tip. The task of determining the stress condition from the applied load and resulting strains is left to the students as a lab exercise. Problems relating to deflection, acceptable material stress levels and resulting margins of safety are just a few examples of what can be studied with the TrueStructures Lab. Adding additional strain gages is a straightforward process and can be accomplished at any time with the lab. "I'm hoping that by utilizing a real airplane part, a real example of aerospace engineering, that the students will become more interested and more engaged with what they are studying. The wing structure presents almost limitless lab opportunities. Of course, we've made the TrueStructures Lab extensible. Strain gages can be added at any time. Countless opportunities exist just in the study of experimental technique, strain gage principles and the practical aspects of stress/strain measurement. The usual simple beam and tube are provided to prepare the students for the more challenging problems encountered with the wing itself." "Our in-house engineering staff has had a lot of fun putting this product together, with all of them wishing they had such a device when they were students. It's actually pretty exciting to see the theory come alive as you operate the load wheel and see the strain increasing." Turbine Technologies, LTD will begin taking orders for the TrueStructures Lab on May 2nd with deliveries to begin in late summer. Complete with everything needed to begin teaching immediately, the TrueStructures Lab includes a sample lab procedure and background information on strain gages and strain measurement fundamentals. More information on the product is available on the Turbine Technologies, LTD web site.